VJ Choolun is a creative director, artist, designer, and an Associate Lecturer across a range of courses at London College of Communication. 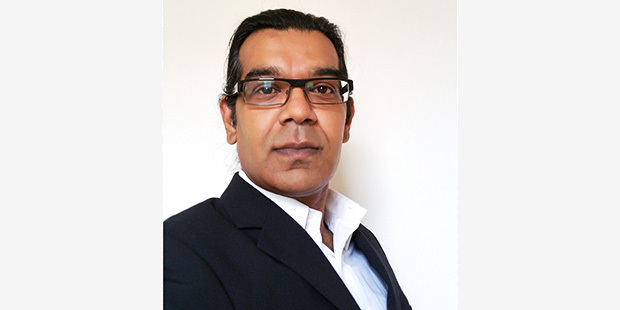 VJ teaches on BA (Hons) Advertising, BA (Hons) Contemporary Media Cultures, BA (Hons) Media Communications, BA (Hons) Photography and Graduate Diploma Photography. He’s taught at LCC since 2001. VJ graduated with a Joint Honours in Fine Art and Graphic Design at Camberwell College of Arts and later studied at the RCA. The basis of his studies was in pursuit of the amalgamation of mediums into quantitative and creative solutions. This multi-disciplinary approach to visual communications in conjunction with analytical psychology and Neural Linguistic Programming form the foundational creative palette from which he teaches today. VJ is also one of the founding partners of AVMC Studios (est. 1992), a creative studio unbounded by medium providing creative solutions to start-ups, charities, games companies. Clients include Saatchi and Saatchi, BBC, VSO, Southbank, M & S, Daily Mail, Royal Opera House, Vodafone, and London Fashion Week. VJ founded the studio with Angela Michanitzi. His works are often conceptually underpinned providing both ‘digital and analogue’ solutions in the form of advertising, web design, product design, concept art, branding, web, film, animation, illustration, fine art, and is currently authoring a children’s novel. His passion for science and future technologies is another area that he gains inspiration from; researching topics such as robotics, nanotechnology, artificial intelligence, wearable technology, and 3d printing. Over the last twenty years teaching, he has helped to evolve the skills and minds of many multinational students across a multitude of courses ranging from FE to HE, BA to MA. His creative thinking classes, his digital workshops, commercial applications, and futures lessons have paved the way for many award-winning professionals in art and design.